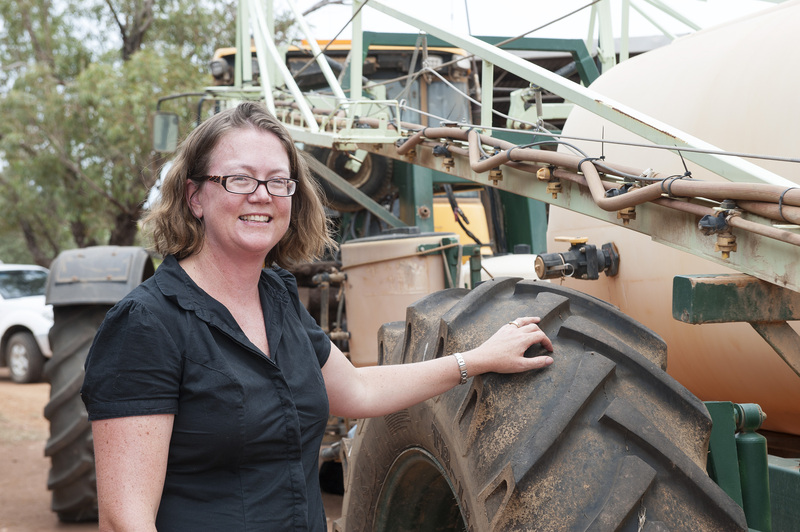 DAFWA researcher Bindi Isbister is part of a GRDC-funded project looking into the use of deep ripping and other soil compaction amelioration tactics coupled with controlled traffic farming to address deep subsoil compaction. Options for managing soil compaction across the Western Australian grainbelt are evolving as the use of more efficient, but bigger and heavier, cropping machinery drives this problem deeper underground. As a general rule, a machine with a 10 tonne axle weight causes crop-constraining soil compaction to a depth of 30 centimetres. But most modern farm machinery far exceeds this level and can cause subsoil compaction to 40-60cm. Grains Research and Development Corporation (GRDC)-funded research by the Department of Agriculture and Food WA (DAFWA) is finding the problem can be addressed using deep ripping and a range of other soil compaction amelioration tactics, coupled with controlled traffic farming (CTF) that reduces the risks of re-compaction. DAFWA development and research officers Bindi Isbister and Paul Blackwell will outline the success of these combined systems at the upcoming Grains Research Update, Perth. This GRDC event is being held at the Perth Convention and Exhibition Centre on February 29 and March 1 and registrations and programs can be found here. In 2015 trials, DAFWA researchers found new methods of removing compaction in sandy textured soils by deep ripping to 55cm and topsoil slotting could boost wheat yields by 1-1.7 tonnes per hectare and provide a return of $6-$16 for every $1 invested. Ms Isbister said the profitability of such systems was driven by providing plant roots with better access to vital deeper subsoil moisture and intercepting leaching nutrients more effectively, which converted to higher production of often better quality grain. “Soils across much of WA have a low clay content and limited capacity to naturally swell and crack to remove compaction,” she said. Ms Isbister said for shallow soil compaction, at a depth of 20-30cm, standard deep ripping or other soil renovation methods - such as mouldboard/inversion ploughing, spading or ploughing - were often sufficient. She said these techniques also helped to alleviate soil repellence (with addition of clay-rich soil) and/or subsoil acidity issues (when used with lime incorporation), but did not accommodate the use of CTF easily. “We are finding it is best to fix the topsoil to 30cm first by addressing compaction, acidity, weeds and/or water repellence and then to implement CTF while working to remove deeper compaction at 50-60cm,” she said. CTF reduces the percentage of the paddock that is ‘wheeled’ in any given season by restricting traffic to permanent wheel tracks or tramlines and leaving uncompacted ‘root beds’ for plants to access moisture and nutrients. Ms Isbister said WA researchers and growers were finding that CTF adoption was the best way to minimise re-compaction, maximise the longevity of deeper soil renovation treatments and improve the economics of these combined systems. Previous DAFWA trials in the central grainbelt have found crop yields can increase by 0.5-1t/ha where CTF is used in conjunction with deep ripping on compacted sands and the benefits are highest when growing season rainfall is below average. Dr Blackwell said deep ripping equipment could be modified to match CTF systems by removing some tines or spades in line with the permanent wheel tracks to only cultivate to depth in between. He said the best way to decide on a CTF width was to map out the widths of existing machinery operations and tracks using graph paper or the ‘Wheeltrak’ calculator, developed by PrecisionAgriculture.com.au, DAFWA and other partners. A new version of ‘Wheeltrak’, funded by the GRDC, will be available in 2016 and further information is available at www.precisionagriculture.com.au/Wheeltrak.